Al Oerter was amazing. In the 1956 Melbourne Games at the age of 20 he won his first gold medal in the Discus Throw. 12 years later at age 32 at the Mexico City Games he won his 4th in a row. He was an athlete who the bigger the stage was the bigger his performance was. He was never the favorite to win the gold. There was always someone else who going into the every Olympic Games who was the choice to win. Sometimes there were more than one person who was thought to be better than Al Oerter. In the end it was always Al Oerter standing on top of the platform with the gold around his neck. Al Oerter was a big man at 6’4″ and 280 pounds and he was a natural throwing the discus. In 1957 after his first gold medal he was nearly killed in an automobile accident. He recovered in time to win again at the 1960 Rome Games. 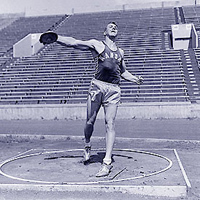 He set his first world record in 1962 when he became the first to throw the discus over 200 feet. Before the 1964 Tokyo Games he was the favorite but then he got hurt a neck injury and then torn cartilage in his ribs. Despite great pain he won his 3rd gold medal setting a new Olympic Record. In 1968 his American teammate Jay Silvester was the favorite to win. They thought Al was too old, what did he do? Al Oerter brought home his 4th gold medal in the discus. After the 1968 Games Al retired from athletics. In 1980 at the age of 43 he made a comeback. His attempt to make the team fell short, he finished 4th in the Olympic Trials but he did set a new personal best. The United States would boycott the 1980 Games anyway. When he was just throwing for a tv spot he threw about 243 feet which would still be a world record. At the 1984 Olympics in Los Angeles Al Oerter carried the American flag in the Opening Ceremony. In the 1996 Atlanta Games he would carry the torch into the Olympic Stadium. Al Oerter died at age 71 in 2007.
never knew about the neck injury – how sick is that. that must have been quite um an exhilarating feeling throwing with a neck brace. i knew about this trying to make a comeback in 80… but i never knew the story about his throw in practice that would still be the record…he was in his 40’s..insane..